Beach soccer is on the rise in the U.S. It is a game played in Virginia, California, even the Great Lakes in Ohio and Michigan. 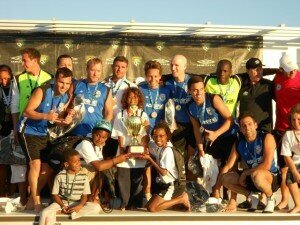 But when you want to talk about beach soccer, you talk to Florida Beach Soccer FC. They are the leaders in the sport, landing some serious hardware in 2011. The most impressive was the Major Beach Soccer Men’s National Championship, claimed by FBS on December 18th after a 1-0 victory over Team Spartan in Clearwater, Florida. It must be a lucky place for Florida Beach Soccer as they already claimed a major championship there in July. FBS was also victorious at major tournaments in Virginia Beach and Trinidad & Tobago. Why all the success for FBS? Experience, experience, experience. They know the sport better than anyone in America. Current USA Beach Soccer National Team players? Check. Former USA Beach Soccer National Team players? Check. Professional players? Check. World-All Stars? Check. The #3 player in the world? Check. Simply put, Florida Beach Soccer is loaded. And the media is finally taking notice. FBS was the star of the winter edition of USL Breakaway on Fox Soccer Channel. Highlights and interviews helped the club get national exposure thanks to an event run by North America’s largest soccer league. The club is a leader off the field as well, landing the only kit sponsorship in all of beach soccer. Florida Beach Soccer recently signed a five-year deal with Admiral Sportswear, the brand once worn by Manchester United, the New York Cosmos, and the English national team. 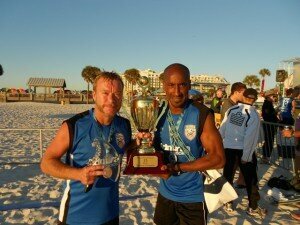 Captain Francis Farberoff is one of the big reasons for the success of Florida Beach Soccer. He grew up in Brazil, eventually bringing his talents to St. Thomas University in Miami. He became a star midfielder and would play in amateur and semi-professional leagues before turning pro on the beach. Professional beach soccer player? That is what FBS is all about. Promoting the sport anywhere they go with the vision of growing the sport into pro leagues from coast to coast. It is quite a goal, but certainly a possible one according to Farberoff. The game is one of skill, small fields, and big goals. No walls, uncertain surfaces, direct kicks from anywhere …. every aspect of the game is a challenge. In other words, beach soccer is entertaining for players, coaches, and most importantly the audience. If clubs follow the path blazed by Florida Beach Soccer, then they will have a chance to make it big.